Early results from the Canadian Hydrogen Intensity Mapping Experiment (CHIME) have recorded bursts of radio waves from outside our Milky Way. This finding constitutes the second ever recording of these repeating ‘fast radio bursts’ (FRBs) in history. These intense bursts of low-frequency radiation have only been detected once before in 2015 at the Arecibo radio telescope in Puerto Rico. The repeating FRB from a single source was one of 13 bursts detected during CHIME’s pre-commissioning phase in July to August 2018. The CHIME telescope was only running at a fraction of its full sensitivity and field-of-view, but has already published two papers in Nature concerning its findings. 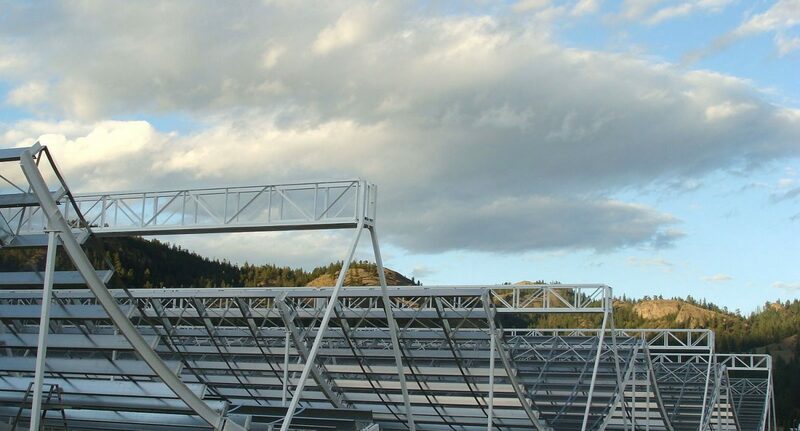 The CHIME observatory is located in the Okanagan Valley in British Columbia. Made up of four 100-metre semi-cylindrical antennas, CHIME is sensitive to radio waves emitted by the most abundant matter in space: neutral hydrogen. It will be able to map over 3% of the total observable volume of the Universe, more than many other current surveys. Researchers from CHIME’s participating institutions found that the majority of the 13 bursts were within the lowest frequencies in the telescopes range. This suggests that other FRBs are likely to be found below CHIME’s minimum of 400 MHz. What exactly causes these FRBs remains a mystery. The fact that the signals are repeating rules out one-off events like supernovae or mergers. With their data showing signs of “scattering,” scientists from the CHIME team have concluded that the FRB sources are likely to be intense astrophysical objects in unique locations in their galaxies. An online list has compiled a list of theories that include collapsing neutron stars, interstellar collisions, and yes, alien spacecraft. There is still a lack of observed data. FRB events show great diversity, revealing that there is still much to uncover before researchers can truly begin giving more conclusive statements about their characteristics, origin, and specific locations. Many astronomers are excited at the possibility that FRBs can reveal valuable information about the environments that surround them and that they travel through. As the radio waves make their way to Earth, they may travel through clouds of gas, causing the different wavelengths that make up the radio burst to slow down by different amounts. By studying the spread of wavelengths that reach Earth, and their respective times of arrival, researchers can better understand how much material the radiation had to travel through on its journey.